WoW Petopia Community • View topic - Hunter Pets with Special Visual Effects Directory. Hunter Pets with Special Visual Effects Directory. Post subject: Re: Hunter Pets with Special Visual Effects Directory. Oh I remember these being mentioned before as a "No No" pet. Thanks for the heads up, added to the list. Venomtip Needler wasps in ZG (four colours) have glowing green lights on their feet that seem to be permanent. The glow stays after taming??? I may test this later to be sure. And silly me it did not even click that's what you meant. Such enthusiasm I have. I believe so. I suspect that other shot is actually of the other wasps in the instance. They don't have the green tips. ... or it's simply one that someone tamed before taking the shot. Nps, I'll add it to the list! Ty. All versions of taming with visual effects has been completely hot fixed and the pets are no longer available. There's the Ice Steppe Rhino/Bull as well. Though, it's a bit of a special case. 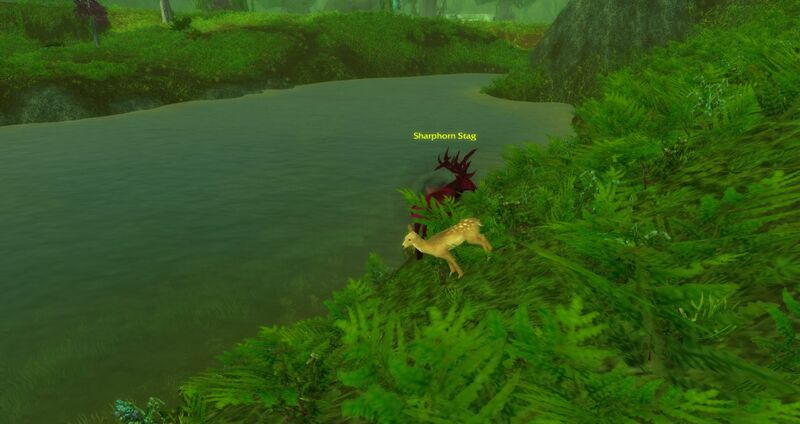 For those who don't know or remember, there was a way to time your tame of one to finish at the exact time it was killed by a proto-drake. This gave you a pet that, for all intents and purposes, was permanently dead. You'd summon it and everything told you it was dead (target frame, mouseover, etc). It could not be controlled in any way, but could be buffed and healed, though the health bar always stayed at zero. The fun part is that if you called him while flying in the air, his corpse would hover at the level you called him. People tend to freak out when seeing a hovering dead rhino. Definitely one of the funner useless pets. Been wondering recently if he's still tameable if you time it just right. Doubt it, but glad I still have mine from all those years ago. Kept safe in the stable next to my flaming boar, oil-stained wolf and bird, purple glowing bear, and stabbed ghost wolf. I'd heard a little bout these guys and they looked pretty horrific from memory. Though at the time, I never looked into to much, it just looked to much like you were dragging around a Rhino carcass. Thanks for the suggestion though, but I think in this case they may fall into the category of "Special Animated Effects" rather than "Special Visual Effects". So the Sly Fox in Valley of the Four Winds wouldn't count for this list, because the butterflies are only during camo? 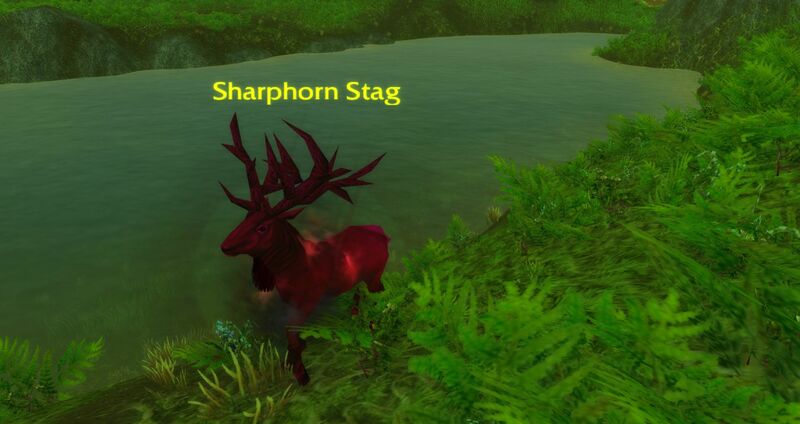 The Sharphorn Stags in Feralas near the Twin Colossals have a red rage-effect aura. Not sure if it counts for this list, but I saw them while working on Loremaster and didn't see them on the list. Oh yeah, I didn't think to now check newly added pet families Do you know if the "Red Rage" effect is permanent? If not I might go have a look see just to confirm. I know there are a LOT of visual effects on beasts in WoD, but figured I would potentially add those once all models have been confirmed/implemented/tamability confirmed and it goes live. Thanks for the heads up Scotty, very appreciated. Unfortunately it doesn't seem to be permanent... and it seemed to come and go. Only going 'rage' when I was near them, and showing up as normal when I flew a bit away from them. Also, when they died the rage effect was lost. However, I did notice I did not have to have any prequests done in the zone. I took 4 different toons out there, three of which had never set foot there (one was a booster 90). All of them saw the rage effect. Here's a couple links to photos of the stags in their rage effect. Sorry to bring this thread back to life. But there seems to be A LOT of buff pets talk lately. I cannot remember which effects persist through death or not. Anyone willing to update this list?????? Anyone remember which keep them?? Found something is not in the list ... But maybe they are not in the list that's why they didn't go extinct ... Guess U guys know what I mean right . So good luck for looking .